There are sev­er­al joys pecu­li­ar to the inde­pend­ent writer. One of them is the respons­ib­il­ity of advert­ising. A few weeks back, I made the decision to plough more of the earn­ings from my books into these adverts. One of the places I wanted to advert­ise is a site call kboards.com, a busy hub full of Kindle writers and read­ers. What Goes into the Ad? Overall, I’m happy with them. They’re short. They tell you that the main char­ac­ter is a woman, that there are three books (so far) worth of story, and that the genre is sci­ence fic­tion (time travel). My girl­friend looked at a draft of the fin­ished GIF and said that read­ers wouldn’t know any­thing about the qual­ity of the books. I agreed, and added a quote from an SFX of Déjà Vu as a ‘zero slide’ at the begin­ning. Fine, I thought. I’ll just cre­ate an anim­ated GIF. For the unini­ti­ated, an anim­ated GIF (pro­nounced ‘fish’) is a little video. I don’t have any fancy anim­a­tion soft­ware. I do, how­ever, use Apple Keynote to give psy­cho­logy lec­tures. Keynote is a par­tic­u­larly advanced present­a­tion plat­form that has text effects, slide trans­itions, and tim­ings. 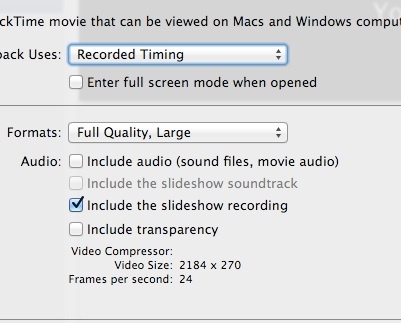 Crucially, it can also export a present­a­tion as a Quicktime movie file. 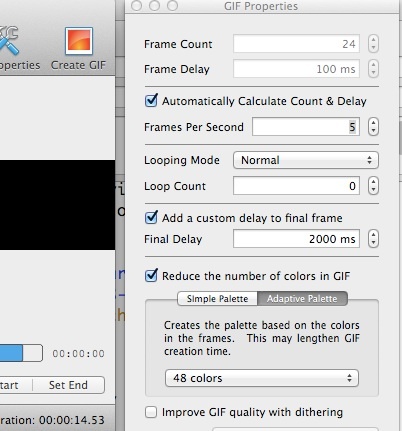 That file can then be dropped into a Mac app called GIFBrewery to make an anim­ated GIF. Next, you’ll want to have Keynote change its slide size to 728 x 90. Guess what? It won’t, because 90 is too small. You will need to cre­ate a slide with the ban­ner ad pro­por­tions but more pixels. I’d sug­gest 2184 x 270. Create as many slides as you like. Each one of these will be a ‘moment’ in your anim­a­tion. For my own ban­ner, there were sev­en moments. 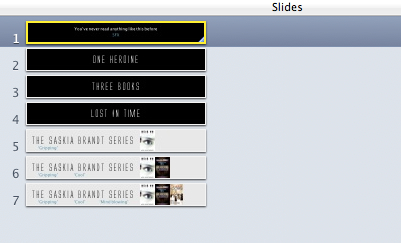 Set the tim­ings and trans­itions between the slides. You’ll see that, for the example below, I’ve set the trans­ition between the first slide and the second to be the ‘sparkle’ effect; the sparkle moves left to right; and the trans­ition activ­ates auto­mat­ic­ally after three seconds. 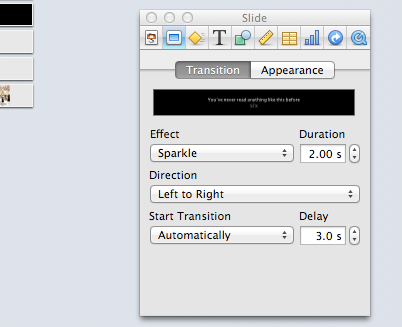 Once you’ve set up auto­mat­ic trans­itions between slides, Keynote should be able to play through the ‘present­a­tion’ without manu­al inter­ven­tion. About five-ten seconds long is prob­ably enough—but if your ban­ner ad is awe­some, maybe people will watch it for longer. Who knows. The Quicktime file is some­thing that GIFBrewery can hap­pily use to pro­duce your ban­ner. ‘Resize’ will allow you to reduce the pixel dimen­sions of you video. If you’ve impor­ted from Keynote, these dimen­sions will be too large, so here is where you can reduce it to 728 x 90 pixels. The ‘GIF prop­er­ties’ pop-up allows you to tweak the frame-rate (and there­fore over­all speed) of the GIF. You will also find options for redu­cing the num­bers of col­ours. Remember that the webpage host­ing your advert needs the GIF to have a very small file size. In the case of kboards.com, this is less than 60K. I hope that’s help­ful. It took me a couple of nights of pokery, not to men­tion jig­gery, to real­ise that I could use Keynote to pro­duce a movie file, and then a good piece of soft­ware to gen­er­ate the GIF.